For about the last three months, now, I've been thinking just how cool it would be to have a really decent set of chef's knives. The ones that we've had stuck in our drawers for years and years have served relatively well, but I couldn't help but wonder if a really good knife would be easier to wield. I started doing some research. I talked with my sister and brother-in-law, chefs whose opinions I trusted. I read articles. I checked out YouTube videos. I took home brochures from cooking stores. I did some serious research. But still I wasn't sure. Would a good chef's knife really make a difference? Would it be worth the money? Some chef's knives are seriously expensive! One thing I learned is to not bother asking the help at cooking stores what knives to buy. Either they don't have a clue, so they assume the most expensive one is the best, or they have a vested interest in selling you the most expensive one. 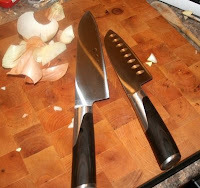 My biggest problem was that, as a completely self-taught beginner, I had absolutely no idea how to tell if a chef's knife was truly better or not. The ones I'd been using were the only ones I knew. At the stores, they'd sometimes let me heft them, but you couldn't really cut anything with them and see. How's a guy to tell? Especially if he's really a rank beginner with next to no real experience? The Knuckle Test--If you hold the knife in your hand, and you put the edge of the blade on the cutting block, as if you're cutting something, the base of the blade needs to be deep enough that you're not knocking your knuckles on the board. The Triangle Test--The shape of a "cross section" of the blade should be a triangle. By that, I mean that from the back edge of the blade to the cutting edge should be smooth. It shouldn't have a bevel making it sharp. The Stiffness Test--The blade should be pretty stiff, and shouldn't bend much, if at all. The Balance Test--If you hold the blade horizontally, and balance it on your finger, the balance point should be just at about the place where the handle meets the blade, maybe even a bit into the blade. But keep in mind that I have no formal training, and I have no idea what I'm really talking about. As I went out shopping to find the chef's knife that matched these criteria, I had to add some additional parameters, like the Budget Test. It couldn't cost more than $40. That's partly because I still think paying $400 for a knife is a bit absurd* (especially at my skill level), and partly because our family budget really can't stretch any farther than that, anyway. Anyway, in the end, after shopping and looking and hoping for three months, I found a knife in, of all places, IKEA. It fit all of the criteria listed above, and in addition, it looked nice. And, it was only $20 for an 8" french chef's knife. With a little negotiating with the lady of the house, I thought that I might actually be able to pick up a Santuko knife as well! Well, I got some good spiffs from my work today, and with her blessing, I went shopping. I came home with a 6" Santuko, an 8" chef's knife, and a wood cutting board. All the way home, I was getting more and more excited, and more and more nervous. What if they're lousy knives? What if they're dull? What if...? What if...? I finally decided that even at twenty bucks apiece, they were still going to be better than what I'd been using so far. After getting my kids in bed, I settled into the kitchen to give it a try. I got out some carrots, because I knew that it would be a good test. Carrots are stiff and kinda harder to cut sometimes. I peeled three or four and set them on the chopping block. I pulled one toward me and got it in position to cut. I positioned my left hand like I'd seen in the YouTube videos, and like I'd been practicing over the last few months. I took a deep breath, lifted the blade, and cut the carrot. It felt like I was cutting air. It was the most amazing feeling. I made one cut and stood there, dumbfounded. I just stared at the knife and at the carrot. It was sooooo coool. I got my left hand back on the carrot and started chopping, making the circular up and down motions with my right. I could hear the clacking of the blade on the wood, but I wasn't feeling resistance. It was smooth and quick, and I was in heaven! I am now convinced. A decent chef's knife DOES make a big difference. *My father has a fountain pen he paid $400 for. Now THAT's absurd. Im not a good fan of cooking, but I love to eat. I like the information shared. Great article! Great article. I had the same experience when looking for the best knife set when my husband and I got married. You can read about it in my blog.